OK last week it was smoking..... This week its booze ...... People will start talking I know BUT trust me its all in the name of Vintage Research (Well that's my excuse and I am sticking with it). So I have been looking into the origins of these beautiful little saucers I found and have uncovered a whole history of the drink ABSINTHE. Absinthe is an anise flavoured spirit derived from herbs, including "grande wormwood", together with green anise and sweet fennel. 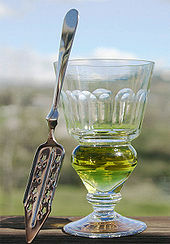 Absinthe traditionally has a natural green colour but can also be colourless. It is commonly referred to in historical literature as "la fée verte",the "green fairy", in French. It has a very high level of alcohol and is normally diluted with water and sugar is added by the drinker to sweeten it. It was popular in France through the 1840's when it was given to French Troops as a malaria treatment....... I guess there had to be an upside to Malaria !!!!!!! These Absinthe Saucers, or Sous Verre, were served under the Absinthe glass accompanied by an absinthe spoon for adding sugar to this slightly bitter beverage. The saucers denoted the cost of their orders and were stacked up acting as a running tab, or method of calculating the bill. rim, and the colour denoted the price of the drink. Often the price itself was enamelled on the rim of the saucer as well. As a client ordered more drinks, he stacked the saucer for each in pile on his table. When it came to settle the bill, the waiter simply added up the number of each colour saucer to arrive at the total. These gorgeous little saucers represent a unique piece of history, surviving absinthe's heyday a century ago. So...... Its 5 o'clock somewhere...... pass the Absinthe !!! Absinthe makes the heart grow fonder........nuf said!! You're a veritable goldmine of information! They are gorgeous. I, predictably, want them all! These are beautiful saucers. Incidentally, the octagonal ones date to the later 1920s to 1930s Art Deco period. Thanks for sharing the photos.